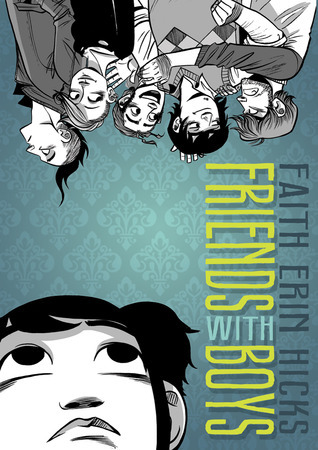 In the young adult graphic novel Friends With Boys, Maggie has been home-schooled her entire life, but all that is about to change. Daughter of the police chief, little sister to three older brothers, it’s time for Maggie to face the real world… by attending public high school. It’s loud, it’s crowded, it’s overwhelming, but soon Maggie finds friends in dare-to-be-different Lucy and her protective big brother Alastair. To complicate matters, Maggie misses her mother, who abandoned the family for reasons left unexplained. And — oh, yeah, there’s a ghost. Maggie is haunted by the ghost of a woman who died of a broken heart years centuries earlier, and even though she doesn’t do much except hover around, Maggie would kind of like to be left alone. I loved the artwork in Friends With Boys. The characters are well-defined, each with an individual style, and their faces are quite expressive. Maggie is cute, a bit of a non-conformist without being obviously “in your face” about it, definitely a girl who’d like to hang with her brothers rather than hit the mall or paint her toenails. I liked the book very much. Without having to shout about it, Friends With Boys shows the incredible strength that can come from having a supportive family, the importance of staying loyal, and how difficult it can be to be different. In a variety of ways, each character has had to decide whether to choose popular acceptance over individual quirks, and the book does a great job of reinforcing the idea that true friendships can only happen when the people involved value each other as they are, not as they “should” be. This is listed as a young adult graphic novel. I’d recommend it for adults as well as teens. The story is engaging, the characters are dynamic, the artwork is light-hearted but detailed, and the plot never drags. Check it out! Oh, you should definitely check this one out! And if you do, let me know what you think!